Fellside Cottages Self-cateringA very spacious, well located and superbly equipped base for small or large groups of 2-30. The four cottages are around a courtyard but have privacy from each other. There are several areas where groups can gather together for eating or socialising. We can offer a range of options to celebrate special events, including an onsite marquee for hire, a covered BBQ area, local caterers, organised activities such as canoeing, ghyll scrambling, off road biking, climbing, or just up the road, wine tasting. Alternatively our village pub is just a short stroll away. The Pennines provide many walks from the doorstep including the spectacular glaciated valley of High Cup Nick, or quiet woodland walks in the Eden Valley. The country lanes are perfect for cycling, and bike hire can be arranged locally (bikes delivered with all extras provided). Further afield, the numerous attractions within an hour's drive include aerial zip wires, animal parks, working mines and a Via Ferrata, a new and exciting way to climb a mountain. All bedrooms are spacious and many have en suite facilities. There are many traditional features including 3 real fires, with all properties being listed, but all modern conveniences too. All properties are fully centrally heated and prices include all electricity, bed linen and towels with no hidden extras. There is off-street parking. 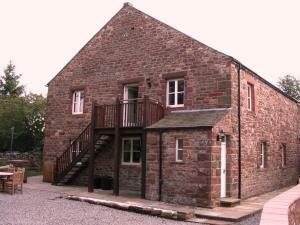 4 spacious, well equipped & well located cottages/barn conversions in quiet Pennine village, near pub, sleeping 2-30. Ideal base for groups. Numerous, varied activities from the doorstep or a range of options for celebrating special events. Fellside Cottages offers weekly bookings starting on any day and sometimes short breaks. The Farmhouse offers weekly bookings starting on any day and sometimes short breaks. From M6 jct 38, follow signs to Appleby. Cross river, turn left, then 3.5 miles to Dufton on B6542. Find pub on right, follow road downhill to end of row of houses on right, take right turn after last house. From A66, Scotch Corner, take Appleby turnoff, bypass town and follow B6542, as above. From M6 jct 40, take A66 to Appleby for 10 miles, turn left to Long Marton, left at T-junction, right into village and then almost immediately turn left into lane before first house on left. Go forward a short way and take first right. This brings you to the back of the properties. Public transport, trains to Appleby or Penrith. The cottage was veryclean and had everything you would need for a lovely stay . Liam and Sue were on hand for any help needed. The area is very beautiful and very calming .